I've really been wanting to do a watermelon mani after seeing so many great summer ones! I've had my colors picked out for weeks. I used Wet N' Wild Dreamy Poppy for that great pink melon color. It's a pink/red coral cream that I haven't tried yet. I used a BC and three coats of Dreamy Poppy since there was a bit of a nail line. I let that dry and free-handed by rind (tips) with Zoya Ivanka. I've had the Sinful Bad Chick white cream nail art striper in the closet from a previous haul. I used it to draw a thin line between the tips and the pink. The pictures are of my left hand which means my non-dominant right hand is the one that did the painting so the line is a bit thicker on this hand. I would have photographed my right hand but I have a little stub of a nail that's so short it just looks depressing. Lastly, I opened my new dotting tool and added the seeds in Savvy Ebony Black. One coat of Seche Vite and my end of summer fruit mani was complete! I'm going to try to bust out some fun summer fruits while we still have this fantastic 80 degree weather for a few more weeks. 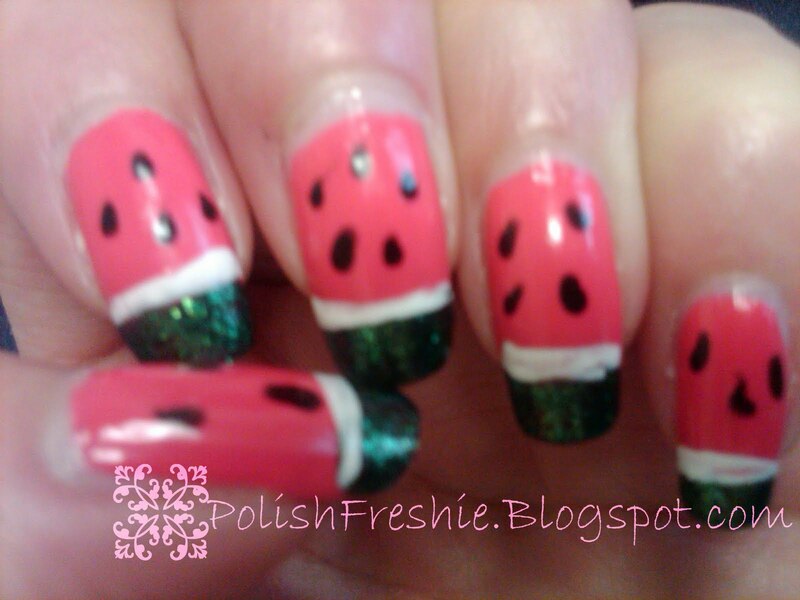 Do you like fruit manis? Any unique ones you've tried? Very cute! 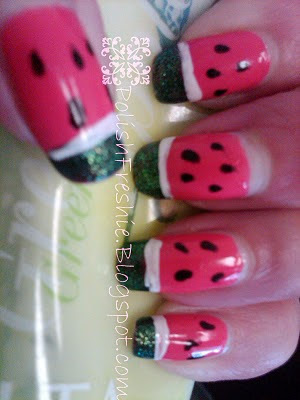 I always wanted to do a watermelon or strawberry mani. I love this! You did such a great job and enjoy the weather while you can! this is amazing! you did such a nice job, so realistic ! Cupcake - I've been eyeing them for awhile! Aggie - Aww thanks! I love summer and hate to see it go =(. Smita - You're sweet thanks! love how the seeds are looking :) awesome detailing! Danielle - Do you have a link? I debated if I should just do index fingers for professional reasons then I thought who cares everyone gets a kick out of what I do every week! I used China Glaze's Watermelon Rind on all of my nails except for the ring, I used Sally Hansen Xtreme Wear - Strawberry Icing. then I accented with the China Glaze, white and black for the rind and seeds.